Dave&apos;s All-American Pizza and Eatery in Danville is a restaurant that lives up to its name. You won&apos;t find a more patriotic, all-American place to dine than Dave&apos;s. Our family recently tried out Dave&apos;s for the first time, and we had a great experience. Dave&apos;s has the freshest salad bar in town! The salad bar has lots of great options for even the pickiest of eaters (like my kids!). You can enjoy the salad bar on it&apos;s own or in addition to your meal. 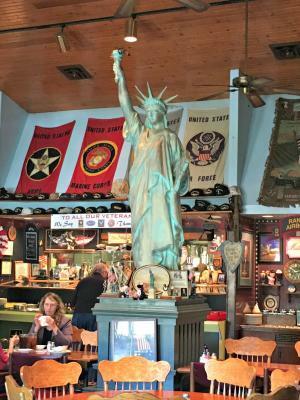 Dave&apos;s has some amazing decor, including authentic military uniforms and an entire corner of the restaurant devoted to Abraham Lincoln. My kids loved the replica of the Statue of Liberty in the middle of the restaurant. My boys both got the pizza, and they assured me it was "awesome!" My youngest shared some with me, and I have to agree -- it was cheesy and full of flavor. Dave&apos;s menu is full of classic favorites (I enjoyed a loaded baked potato), but you can&apos;t go wrong with the pizza. Dave&apos;s has an excellent "Build Your Own Sundae" bar with all kinds of toppings. You can make two trips, although you might be full after just one. Dave&apos;s kindly requests that you turn off your cell phone during your meal, so you can enjoy your meal with family and friends. You can pay for your meal at Dave&apos;s with a credit card, but you can only leave a tip in cash. Be sure to bring a few dollars along so you can show your appreciation to your server. We experienced nothing but top-notch, friendly service during our meal! Dave&apos;s is closed on Sunday and Monday, and is open for lunch Tuesday through Friday from 11 a.m.-2 p.m. Dave&apos;s is open for dinner Tuesday through Thursday from 4:30-9 p.m., and Friday and Saturday from 4:30-9:30 p.m. Be sure to check their hours before planning your trip there! 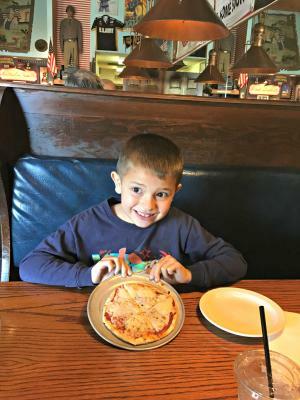 If you&apos;re looking for a fun and friendly dining experience that the whole family can enjoy, Dave&apos;s All-American Pizza and Eatery is a great choice. Our family had an excellent experience, and I look forward to returning!